It’s expensive and it’s hard for me to tell if it works as claimed. Also tried: the Wal-Mart Athletic Works moisture wicking T-shirt. This summer has been hotter than an exhaust valve on Casey Stoner’s Desmosedici, and an extended drought hasn’t helped, making an all-out search for cool clothing a top priority. 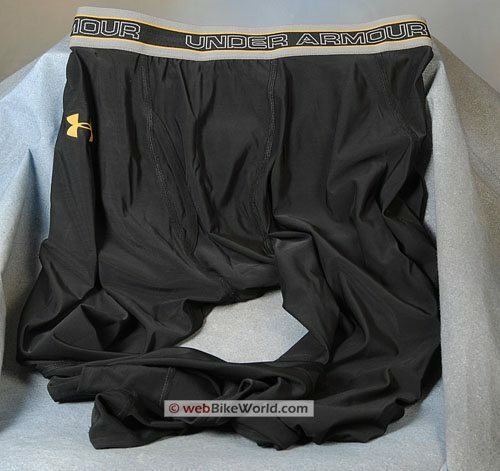 During the search, long-time webBikeWorld visitor “L.S.” dropped me a line (or two) and recommended Under Armour HeatGear Metal wicking underwear as the way to go. Parts of our virtual conversation are included in the comments section below. In case you don’t know, Under Armour has been flying off the shelves and on to the backs of those who need it and many who don’t. It’s the Next Big Thing and it’s here and now — Under Armour is hot, if you’ll pardon the pun. No longer just for locker room brutes, Under Armour gear is in, big time, and on the hook for its 15 minutes of fame. How do I know this? Catch the buzz in the 15- to 20-year-old crowd and you’ll see what I mean. It’s a must-have for back-to-school wear ’07. Well, I’m not so sure about the “originator of performance apparel” boast, but Under Armour started by making a new take on the plain ol’ T-shirt, but designed to help keep athletes cool on hot, sticky playing fields in the American South. Apparently, Kevin Plank investigated a bunch of materials and came up with what is now the “compression” shirt (and clothing), made from a combination of Polyester and Elastane (in an 82/18% mix). The clothing — or in our case — the T-shirt and underpants — must be worn tight against the body for best effect (although the company has looser-fitting garments in their now-huge product line). The “compression” fit and the high-tech fabric is supposed to “wick perspiration off your skin rather than absorb it” and “regulate temperature and enhance performance”. I think what they mean by the somewhat tortured grammar with the “absorb” reference is the tendency of cotton underwear to absorb and holding the moisture, which can make the wearer feel like a wet Spaniel. The brand has become popular faster than you can say “Ducati”, and who better to do the underground promotion thing than in-the-news athletes. Over the past 10 years, Under Armour’s product line has grown in leaps and bounds; it now includes a stunning array of products, sizes, shapes and forms, all built on that basic T-shirt. Clothing, socks, jackets, fleece, eyewear, luggage and even shoes now carry the brand, and they’re designed for summer, winter and in-between. The Wall Street mythmakers (Under Armour is a publicly traded company) claim that everyone from Adidas to Nike to Wal-Mart was caught off guard and most are still trying to catch up. And there may be some truth to this: according to my in-the-know consultant friends, Under Armour has a superior product development strategy and the manufacturing tactics to match, which has so far allowed them to stay far out in front. That’s all well and good, but what about this summer’s relentless heat wave and possible solutions? I’m not fond of riding when the temperature soars above 90 F (32 C), or even 85, truth be told. “If it’s too hot for leather, it’s too hot for riding”, as the saying goes, but I’m not that much of a purist, although even in extreme heat, I make it a point to try and wear the most protective gear I can possibly suffer, covered from head to toe. No jeans for me…. But once it gets over 85, I’m usually wearing some type of meshy textile, although even then, it’s borderline torture unless I’m moving. Fast. We’ve reviewed several other types of what I can only call “motorcycle underwear” over the past few years; see the column on the right-hand side for links to our review articles. The garment that seems most similar to the Under Armour concept, however, is the Dri-Duke wicking shirt, which we reviewed one year ago, and it actually did seem to work. 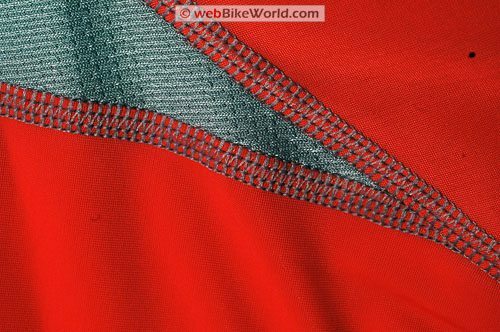 A variety of other wicking underwear products have also been reviewed by various webBikeWorld evaluators, but, to be honest, I’m 60/40 on the concept; I just can’t seem to confirm to myself whether the stuff makes me feel cooler, hotter or none of the above. After all, putting on a full-length layer of skin-tight undies, hoping to get cool in 90+ degree weather seems counterintuitive. Although I will say that one thing that most of these moisture wicking garments do very nicely is to help control moisture when they’re worn under leathers. And they usually make it much easier to get a set of dry leathers on and a sweaty ones off. You want true cooling power for real? See our review of the Silver Eagle cooling vest, which really does work, as long as you’re willing to ride around feeling like that wet Spaniel is curled up around your rib cage. And by the way, it’s one thing to remove moisture from the outside, but don’t forget to keep the moisture going down the inside! How? Read our review of the CamelBak hydration backpack. So, in the interest of science (and at L.S.’s prompting), I bought an Under Armour HeatGear Metal T-shirt ($49.99), and wore it in a variety of conditions during the Wave of Heat we’ve been experiencing. A few weeks later, I also purchased a pair of Under Armour HeatGear “leggings” (e.g., long underwear) for another $49.99 and tried the combination. The total cost of this outfit came to about $115.00, including tax and shipping. Then to complicate matters, I discovered a suspiciously similar-looking $9.99 “Athletic Works” wicking undershirt in Wal-Mart. Although it certainly doesn’t have the fancy stitching of the Under Armour product, and it’s nowhere near as flexy, the label shows nearly the exact same ingredients: 81% Polyester and 19% Elastane. Could this be an 80% cheaper equivalent of the fancy Under Armour gear? And I also had a Holofiber moisture wicking T-shirt hanging around, so I tried that also. My answer? Sorry folks — I just don’t know. 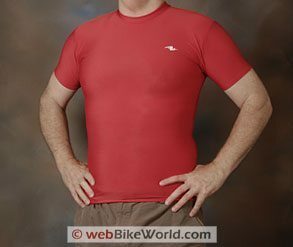 After trying all of the new and old wicking underwear clothing, I honestly can’t tell if the stuff makes riding in white-hot weather any better or any worse than a tried-and-true T-shirt. I’m sure we’ll get a variety of opinions on this one, most telling me I’m nuts, but I can’t seem to tell one way or another whether this stuff really works or not. It’s extremely difficult, if not impossible, to objectively prove it one way or the other. I think I can feel a difference when wearing the Under Armour — that is, at least the HeatGear Metal T-shirt. I can’t tell a thing when wearing the “leggings”, other than they make me feel hotter and like less cooling air is getting through to my skin. Beautiful and high-quality stitching on the Under Armour HeatGear Metal T-shirt. The Wal-Mart $9.99 Athletic Works T-shirt is clalimed to be made from the same fabrics as Under Armour HeatGear, but it’s not cut to fit as well as the HeatGear T and the fabric feels much less flexible. I’ll need to buy a mannequin. No one wanted to pose with these ultra-tight Under Armour HeatGear Leggings. I’ve worn the Under Armour, the Wal-Mart Special, and the Holofiber T-shirt, wearing each one under textile and perforated leather and all in very hot and humid, 90+ degree riding weather. If I was forced to do a ranking, I’d say the Under Armour and Dri-Duke shirt feel equivalent, but since the Dri-Duke can be had for about $25.00, it’s potentially a better deal. The Wal-Mart shirt is maybe next, although it’s hard for me to tell if it’s any better or worse than the others. Holofiber does nothing but make me feel hotter and a Fruit of the Loom cotton T-shirt is somewhere in between. Yes, the cotton T-shirt does feel like it holds the moisture more than the Dri-Duke and the Under Armour, but once I’m up to speed with a mesh or perforated leather jacket on top, I’m not sure if I feel any difference. So that’s why this review has no conclusion — you tell me what you think and we’ll post it in the comments section below. And remember this is only me speaking — my opinion and only my opinion. I know L.S. for sure doesn’t agree with me, so I’ve seeded the comments section below with an edited version of his correspondence. From “B.M.”: “I tried the cheaper Under Armour HeatGear compression shirt and shorts this August. At $25 each they’re a pretty reasonable purchase. I found the shirt did help me stay cooler, compared to a T-Shirt. Not like air-conditioning, but I think it did make a noticeable difference. 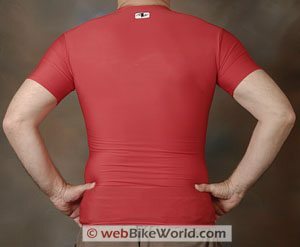 From “C.C.”: “The best summer biking shirt for the buck is Duluth Trading Company’s Performance Longtail T. I used to wear Under Armour exclusively when riding as it is great at keeping me from getting sweat soaked in the summer here in the southeast. However, price and ultimately the fact that is too short when I crouch down on my bike exposing my backside on more than one occasion had me looking elsewhere. I finally ran into this little piece of heaven. Basically a snug fit T-Shirt that is about 3 inches longer than a traditional T and is built out of non-absorbent materials. They also have it in very large sizes and if you buy it in 2+ quantities they are priced at a very reasonable $17.50. These shirts are built tough as they are designed to be used on the construction site and I have yet to run into any problems with one. Another nice bonus is they look like a normal T and not a super tight form fitting shirt. They don’t wick as well, but these shirts breath better. I wear them exclusively now when motorcycling, hiking and kayaking. I have yet to find a single item worn by them that is uncomfortable or has an odd cut. Their items are durable and exceedingly comfortable. Also, they are a great resource for cold weather riding as well. Some of their undergarments are king in my book when the temps start dropping below 60 and getting close to 40. From “M.R.”: “FWIW Silk and natural fibers are better for motorcyclists in one more aspect. From “D.C.”: “I also have a mixed bag. The top coming from Wal-Mart, and the bottoms purchased in REI’s bicycle section. I was going to go back and get the top, but on a trip from the S.F Bay area to the High Sierra Vulcan Riders motorcycle rally last June, they both worked just fine. I also must admit that I don’t wear mine super “skin tight, but rather “stretched comfortably”. With jeans and chaps, plus a shirt and leather jacket I thought like most, that this set up would so hot, I’d be at the first Denny’s for a quick change. No so friends and neighbors. From “B.B.”: “I used some flyweight silk long underwear to keep my 20 lb. Langlitz leathers off my skin during a blazing hot 4500 mile trip down the left coast this July. These are available at Mountain Equipment Co-Op or other good mountaineering stores. I dislike synthetic materials, especially Coolmax, because they get stinky and retain the stink despite washing. My silks kept me dry and cool without getting smelly, despite not washing them for days. From “L.S.”: “Rick, I rode with my Under Armour Heatgear Metal long sleeve T-Shirt for the first time on Wednesday. In a word: Fantastic. I rode in to work in the morning, wearing my Olympia Airglide 2 mesh jacket over the Under Armour. With the temp at about 70 degrees in the morning, that was cold. I’ll have to experiment further and see what the lowest comfortable temp is (next time, I’ll wear a regular long sleeve polypro T in the morning). But in the afternoon, I rode home in 94 degree humid weather. The (BMW) K12R has an outside temperature indicator as part of the display on the electronic digital instrument panel, and I can now guess the outside temp to about 1-2 degrees accuracy. I can immediately tell even a 1 degree change in the temp as I ride through different climes. Wearing the Under Armour Metal T, the 94 degree temperature felt more like the low 80’s. Not a drop of sweat stuck to me, and I was totally comfortable under the Olympia jacket. When I got home and took the T shirt off, the back of it, made out of a stretchy mesh material, was clearly wet with sweat, while the front was bone dry. I felt a little sweaty, but was actually mostly dry. (This) emphasizes again that in order to get the benefit from wicking clothing, the garment has to be skin tight, and cover all the areas that you want to shed moisture from. So don’t make the mistake of wearing an Under Armour HeatGear short sleeve T either. It’s gotta be the long sleeve, and it’s gotta be skin tight. I also have an Under Armour HeatGear long compression pant which I wore down in North Carolina in early June at the BMW rally. Temps were in the mid-upper 90’s to my recollection, and I was perfectly fine wearing those under my mesh pants. Too bad I didn’t have the T shirt to go with them. “I made the mistake of thinking that loose-fitting shirts would be more comfortable, and therefore buying most of my wicking gear in non-skin tight sizes. I must have half a dozen shirts that are therefore fine for cooler weather, but no good for summer. And really, those shirts are even deficient in cooler weather, because while I’m in the house, I’ll sweat a little, and the sweat will stay on my back until I’m on the bike for a while. So for the first few miles, I’ll be uncomfortable while the cold sweat is drying out. If the shirts were skin tight, the sweat wouldn’t be on my back and it’d be much better. “Rick, I did an interesting experiment yesterday. Temps about 90. I rode to one of the local dealers in a medium weight, skin tight wicking long sleeve T. As soon as I got off my bike, I started to sweat. Went into the bathroom there and changed into my Under Armour long sleeve metal T. Much cooler, and when I got on my bike, the temp felt about 10-12 degrees less than in the other wicking shirt.